Whitney Miller was only 22 when she defied the odds to become the winner of Season One Masterchef. Her energy and personality impressed the judges, but it was her creativity and knowledge in the kitchen that made her a winner. 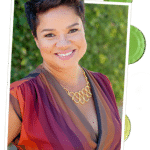 Now, just in time for the holidays, the Masterchef is available to share her recipes for a successful holiday party or meal with some timely and tasty tips. Whitney is the author of the cookbook Modern Hospitality: Simple Recipes with Southern Charm, with foreword by Gordon Ramsay, and is currently working on her second cookbook. 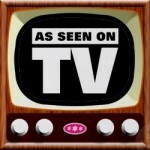 ABOUT WHITNEY: Whitney’s recipes have been featured in the MasterChef and Ultimate MasterChef cookbooks. 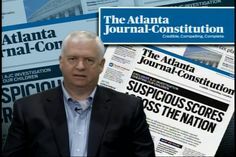 She is a food writer of magazine articles for Flavors (Atlanta), Taste of Home, Southern Living, and Eat. Drink. Mississippi. 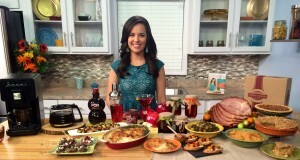 Her recipes, articles, and/or book promotions have appeared in People, Women’s Health, Masterchef, Clean Eating, and Cooking Light magazines as well as online at Self, California Olive Ranch, and SousVide Supreme.com. I like to create a signature dish for our holiday menu. 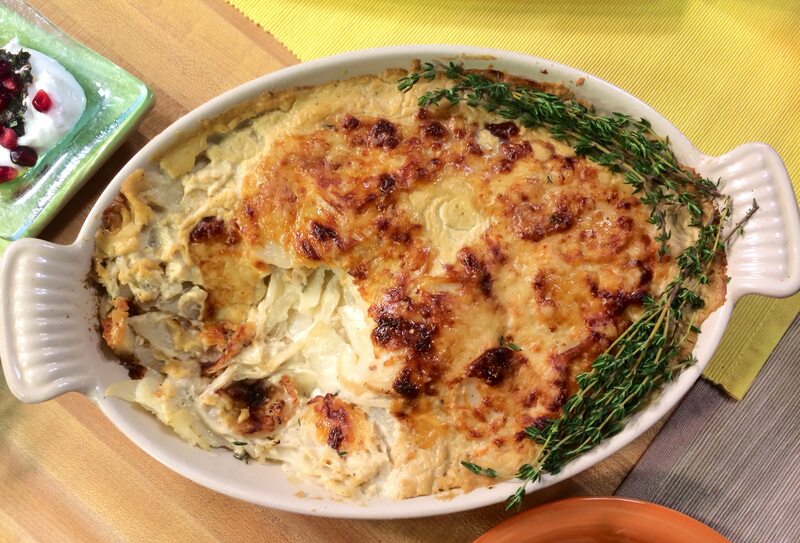 Today, I’ve got a fun twist on a traditional favorite, Honey Mustard Potato Gratin. 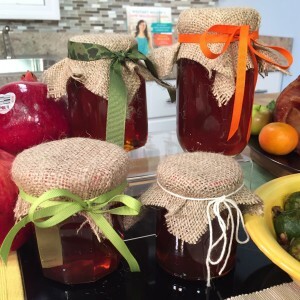 Honey is an all-natural and versatile ingredient that is sure to become your secret weapon when entertaining this holiday season. Its unique flavor complements both sweet and savory dishes. While a traditional potato dish is commonly found at most holiday tables, what I love about this recipe is the use of honey combined with the mustard to provide a balance of flavors, both sweet and tangy. This dish isn’t something that most people would generally think to use honey in, which is why it will wow your guests this holiday season. You can also try this delicious Honey Cups with Brie, Walnut and Cranberry recipe. Honey’s versatility is endless and can span your entire holiday menu. Try adding honey to appetizers, entrees, desserts and even drinks. 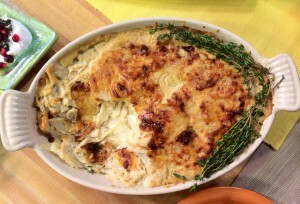 For this recipe and more, visit www.honey.com. In large saucepan, combine half & half, Honey Thyme Mustard, cornstarch, salt and pepper; mix until well blended and cornstarch is dissolved. Stir potatoes and onion into cream mixture; bring to a boil over medium heat, stirring frequently to coat potatoes. Pour potatoes and cream into well-greased 2 quart shallow baking dish. Sprinkle top with grated cheese. Bake at 375°F, 1 hour and 15 minutes, until potatoes are tender when pierced with a knife. Part of my holiday fare is always a great cup of coffee, before a meal but especially after we eat. 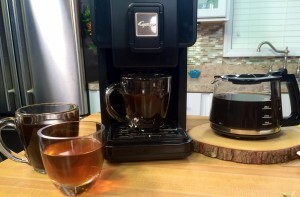 In my spirit of quick-and-easy modern entertaining, I found the Capresso Triple Brew. It’s your single cup coffee brewer and more – because it can also brew a 42-ounce carafe of coffee or single cup of tea for entertaining. You actually get three brewers in one compact model. What I like is that it uses freshly ground beans for a richer, better tasting cup of coffee, plus it saves money versus a pod/capsule system. The price point is $179.99, but I love the versatility of this high end coffee maker, which you can find a Capresso.com. 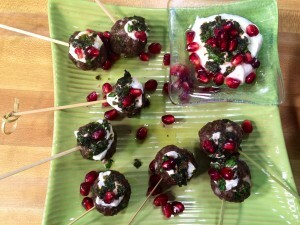 For me, it’s pomegranates that add a sweet burst of flavor to any meal… You’re going to love the Pomegranate Brussels Sprouts and Lamb Meatballs with Yogurt and Pomegranate-Mint Relish recipes. POM Wonderful Fresh Pomegranates are in season now through January. 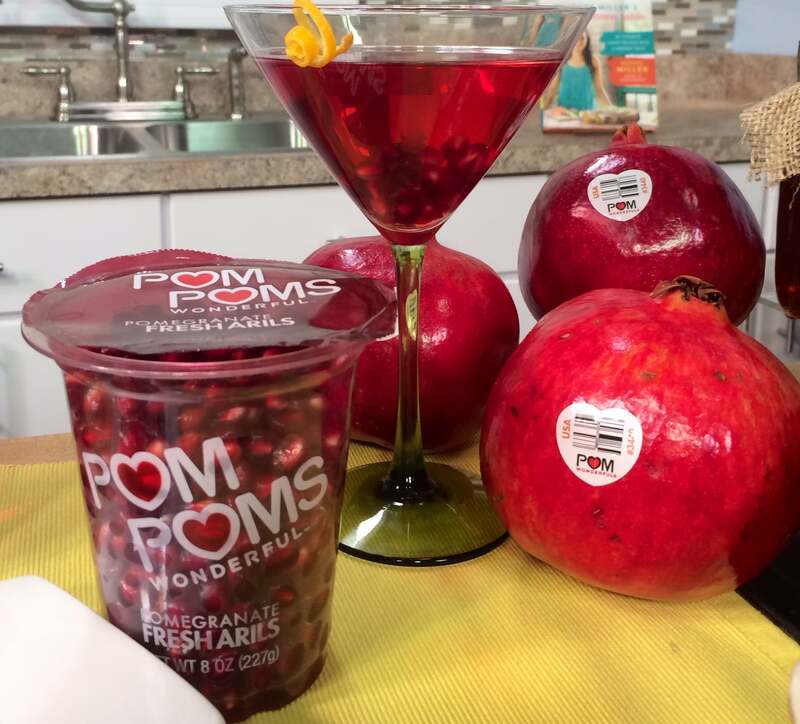 Not only do fresh pomegranate arils add a sweet burst of flavor to any meal but also to your drinks. Mix your favorite mocktail or cocktail, I prefer mocktail, with a POM POMS Fresh Arils. Pomegranates deliver antioxidants like Vitamin C, and are a good source of fiber. And here’s a little tip…if you don’t have time to open a pomegranate, you can get the POM POMS Fresh Arils in a convenient package of ready-to-eat pomegranate arils in either 4.3 or 8 ounce containers. 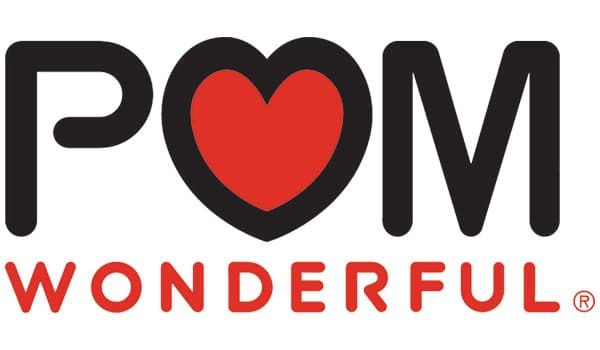 POM Molasses: Prepare fresh pomegranate juice, if necessary. Combine pomegranate juice, sugar and juice from one lemon in a saucepan; bring to a simmer. Reduce until a very thick syrup forms that can thickly coat the back of a spoon, then cool to room temperature. 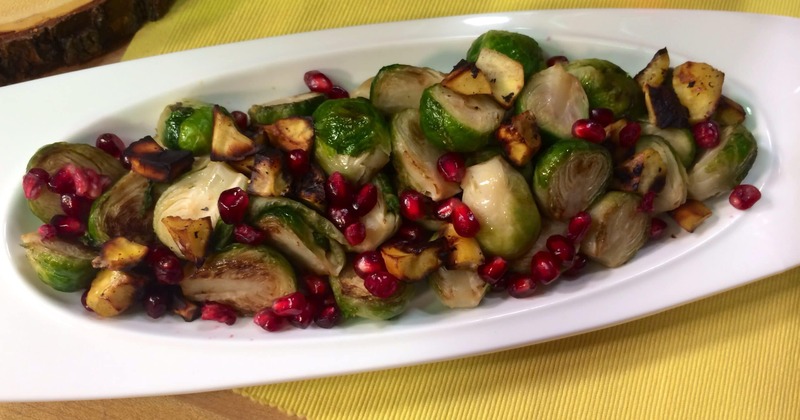 Brussels Sprouts: Prepare fresh pomegranate arils, if necessary. Cut Brussels sprouts in half lengthwise. Blanch in boiling, salted water for 5 minutes or until tender, then shock in ice water to cool. In a large sauté pan, heat some olive oil over medium heat to the smoke point. Remove the pan from heat to add the sprouts. Place back over heat and continue to roast. Add butter to even out browning color to sprouts. Once golden brown, remove from pan and add POM Molasses, arils, lemon juice and crushed chestnuts to finish on top. *For 3 cups of juice, cut 6–9 large POM Wonderful Pomegranates in half and juice them with a citrus reamer or juicer. Pour the mixture through a cheesecloth-lined strainer or sieve. Set the juice aside. Yogurt: Mix the yogurt with the lemon juice until smooth. Refrigerate until serving. Pomegranate-Mint Relish: Prepare fresh pomegranate arils, if necessary. * Add the arils, mint, parsley, lemon zest, olive oil and red wine vinegar together; salt and pepper to taste. Line the meatballs on a plate and put a dollop of the yogurt on each. Liberally sprinkle with the Pomegranate-Mint Relish. I can’t stress enough that modern entertaining is about being easy. Sometimes you have all of the best intentions to make your holiday feast from scratch, but life gets in the way. So this year, to make holiday entertaining effortless, Omaha Steaks is offering the Home for the Holidays dinner; a Spiral Sliced Ham, a Pecan Pie and an Apple Crumble Pie, Brussel Sprouts with Bacon & Shallots and Whipped Sweet Potatoes, at an incredible price of $149.00. 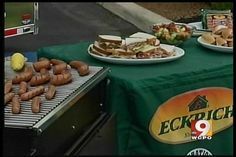 It’s easy to order Omaha Steaks for any holiday gathering you’re planning this year by going to OmahaSteaks.com or calling an 800-number, or visiting one of 75 retail stores. 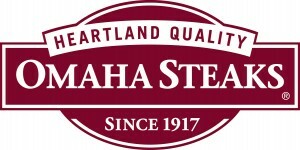 Omaha Steaks is a fifth-generation, family owned company has been providing the finest in premium, All-American grain-fed beef and gourmet foods for nearly 100 years. Their steaks are awesome, and make great gifts. 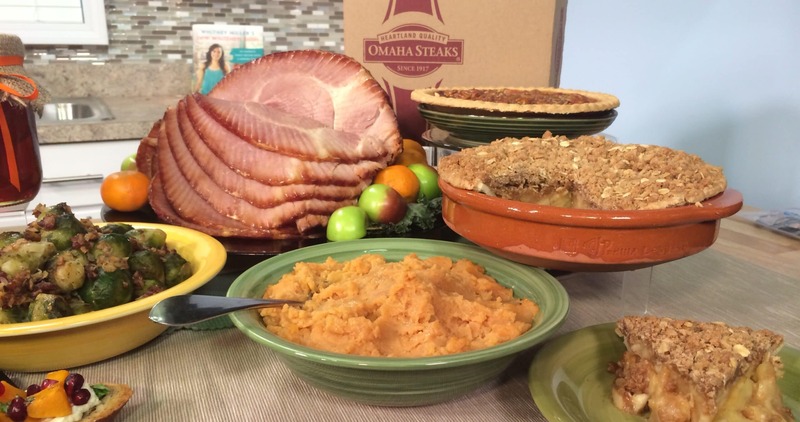 OmahaSteaks.com/product/HomefortheHoliday or give grandma a break by ordering one her meals ahead of time.